One of the best ways to watch birds is to find native plants laden with ripe fruits of the sorts they love to eat. They often come out in the open to feed, and when there is plenty of good food they seem more at ease with human presence, or at least much less likely to fly far away. About two weeks ago I was gathering ripe coffeeberry fruits and was astonished at what a good look I was able to get of the western bluebirds which continued to feed on them, or retreated but a very short distance, eyeing me as I eyed them! Yellow-rumped warblers were with them. A very satisfying way to enjoy birds is to plant native plants which provide food for them. Many berrying plants attract birds. 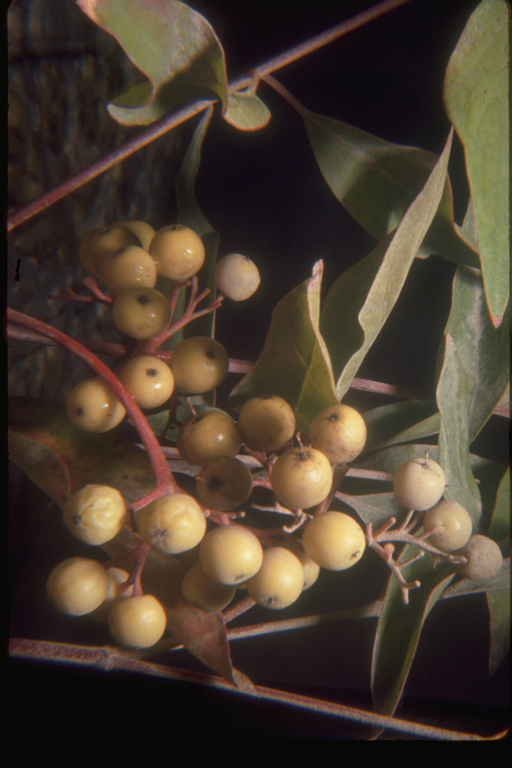 Some people plant non-native species such as pyracantha or cotoneaster for the birds, but native berries attract a greater diversity of songbirds and often greater numbers as well. The flowers, foliage, leaf litter, etc., of native species also supports a greater diversity and abundance of invertebrates upon which the birds will feed year round. This is a common riparian species, sometimes found at the base of hills or in ravines. The fruits in early summer attract an extremely wide range of birds, such as quail, thrashers, grosbeaks, woodpeckers, orioles, house finches, and orange-crowned warblers. It is very easy to cultivate. It does tend to get large and can be rangy, but responds well to pruning. It can be cut to the ground every year (or whenever it gets too big) in its winter dormant season, and it will still grow up to flower and set fruit. This popular landscaping subject provides good bird food. The seeds may be planted where the plants are wanted. They are often planted as screens along property lines. They can be severely hedged, but it is best to allow them to grow at least 6 feet tall, or better yet, give them plenty of room to develop as specimens. For maximum value to birds allow them to be branched to the ground and allow leaf litter to accumulate. This shrub is particularly useful because it provides succulent berries in early fall. Many birds visit it year round for insects. It is an attractive foliage plant, easy to cultivate and grows quickly. This riparian species grows very fast with some water. It features lush foliage, bright blue berries in late summer loved by many songbirds, and some fall color as well. Small birds like to nest in it. To observe it with its associated birds in the wild check out the stands found along Old Page Mill Road in Palo Alto. The bright red berries are the favorite food of robins and waxwings in winter, with more than 20 species of birds utilizing them for food. The seeds contain a small percentage of cyanide compounds, but nevertheless purple finches (seed predators) rip open the fruits to eat great numbers of them. In its season no berry is more attractive. The birds do not get "drunk" on toyon as they do with the non-native pyracantha which often results in tragedy if a busy street is adjacent. Toyon is very easy to grow. Give it enough room so that little or no pruning will be required. Very interesting insects, many bees in some cases, visit its early summer white flower panicles. These are easy to grow and quite decorative. I will never forget how close I was able to approach Phainopeplas feeding on Berberis pinnata fruits at Rancho Santa Ana Botanic Garden in Claremont. They were most reluctant to leave such a delicious feast. In the cashew family, the fruits are attractive to birds that normally eat mast or insects, such as jays, woodpeckers, titmice, and wrentits. Poison oak is an important food for many birds, especially wrentits and hermit thrushes. Poison oak is not as hard to live with as some people think. Obviously it may be wise to clear it away from trails or heavily used areas; nuisance seedlings can be dealt with conveniently and safely with a mini weed wrench (a product of the New Tribe company). There are many other fine berries for birds, such as thimbleberry, hairy honeysuckle, wild grape, blue witch -- any berry species is worth trying. Flocks of yellow warblers will come for Pacific wax myrtle.